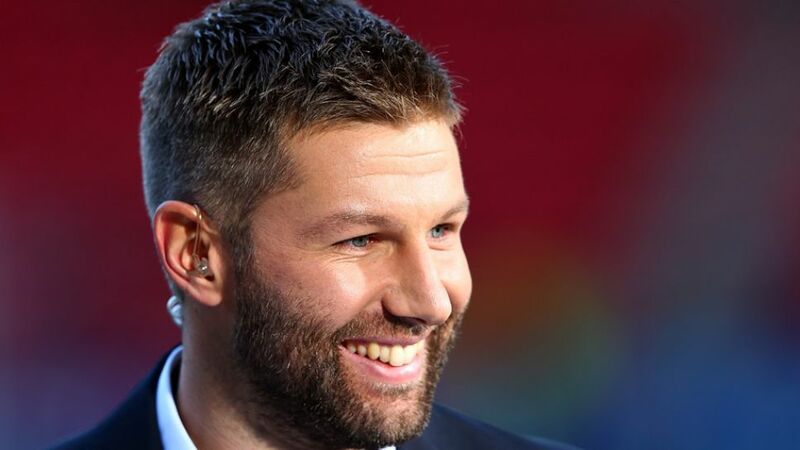 Cologne – Having emerged through the youth ranks at FC Bayern München, and later played for VfL Wolfsburg, Thomas Hitzlsperger is in the unique position of being able to offer an insight into the workings of both clubs. For the second consecutive year the former Germany international, who also laced his boots for VfB Stuttgart, Aston Villa and Everton, among others, will co-commentate the Supercup for the Bundesliga’s international television partners. In an exclusive interview with bundesliga.com, the 33-year-old gives his thoughts on the season curtain raiser, assesses Wolfsburg’s chances and explains why he thinks Arturo Vidal will make Bayern stronger. bundesliga.com: Thomas Hitzlsperger, what significance does the Supercup have in preparing for a new campaign? Do you view it more as another stage of pre-season, or is it the first milestone en route to topping the table? Hitzlsperger: It’s still a part of pre-season preparations but it’s a very good test under professional conditions. You don’t have the 'training camp feeling' anymore. The spectators also realise that it’s not long before the Bundesliga gets underway again. It’s the first real test that really grabs the attention and it’s the first title on offer. It’s a match you take seriously. bundesliga.com: Recent Supercup encounters have been shaped by the duel between Bayern and Dortmund. Are you disappointed there’s to be no “Klassiker” this time? How do you assess the match-up this year – a first in the Supercup? Hitzlsperger: Wolfsburg had a great season last term and got their reward by winning the DFB Cup. Bayern are involved again but they’ll face a team with great quality. Bayern experienced that first-hand last season so I think it’ll be a very interesting match this time too. bundesliga.com: Who are your favourites to win? Hitzlsperger: I still remember the first game of the second half of the season, when Wolfsburg exposed Bayern’s limitations. It’s good for the Bundesliga when there are teams that can compete with Bayern, and Wolfsburg can do that. That said, last year the Supercup didn’t reveal anything about the season that was to unfold: Dortmund won it but then had a bad season by their standards. In that sense you can’t read too much into the result, but I hope the top players are involved and show what they can do, and I hope we’ll see a great game. Wolfsburg have enough confidence and quality to win this match and they’re playing at home after all. Normally Bayern are favourites but I think Wolfsburg have a good chance of winning the Supercup. Hitzlsperger: Klaus Allofs is just being a realist. Wolfsburg will give it everything they’ve got and try to play better than they did last season, but I don’t think they’ll finish ahead of Bayern just yet. Wolfsburg are humble enough to know that and that will serve them well. However, they know they have a good group of players and they won’t be content with second place forever. bundesliga.com: How has the club changed since you were there? Hitzlsperger: It’s changed a lot. Wolfsburg want to play in the Champions League on a regular basis and are set up to do so. The club’s board trust Dieter Hecking and Klaus Allofs and they’re willing to spend a lot of money on players in order to be in the Champions League regularly. Allofs and Hecking are a good team; they’re patient and have a good eye for spotting the right players. They’ve earned the trust of the club. bundesliga.com: Wolfsburg are celebrating their comeback in the Champions League. Will they be able to establish themselves on the European scene? Or is that asking too much? Hitzlsperger: It’s unknown territory for a lot of their players. The Wolves have good strength in depth in their squad, so they won’t just be satisfied with the group stages of the competition but will want to go further. That’s what they should be aiming for. But if it doesn’t all work out as planned this time they won’t start questioning everything. bundesliga.com: In a head to head comparison between De Bruyne and Vidal, who would come out on top? Hitzlsperger: That’s an interesting one. Both of them are top players and I’m looking forward to seeing them play because it’s difficult to say who’s on top. Obviously the match isn’t just about those two players, but they will come into contact given the positions they play in. I’m excited to see what happens because we’re talking about Champions League quality players. bundesliga.com: Who do you think will be Bayern’s key player? Hitzlsperger: If Thiago can stay fit then he can really help the side take another step forward. Douglas Costa has already shown glimpses of why he can be a great addition too. Bayern have got good players in every position. It’ll be an important season because Pep Guardiola wants to win the Champions League. Last season Bayern played outstanding football at times, but the big title has remained elusive. bundesliga.com: Which players are sure of their places in the starting line-up? Hitzlsperger: There aren’t many. Aside from a couple of exceptions like Manuel Neuer, Philipp Lahm and Jerome Boateng, everyone will have to fight for a place in the side. They can only hope they don’t get as many long-term injuries again. bundesliga.com: Finally, what’s your prediction for the Supercup? Hitzlsperger: Losing the Supercup didn’t do Bayern much harm last time. And although they obviously want to win the trophy, I think Wolfsburg will do so.